More power? Here you go! Sometimes wishes do come true. And such fulfilment is even more remarkable if the expectation for it had been almost non-existent. If your parents are Russian natural gas billionaires, your wish for a Lamborghini Aventador as birthday present has good chance of coming true. If your parents are ordinary middleclass people who have to scrimp and save, there’s a good chance you have already become much realistic in your outlook on life. 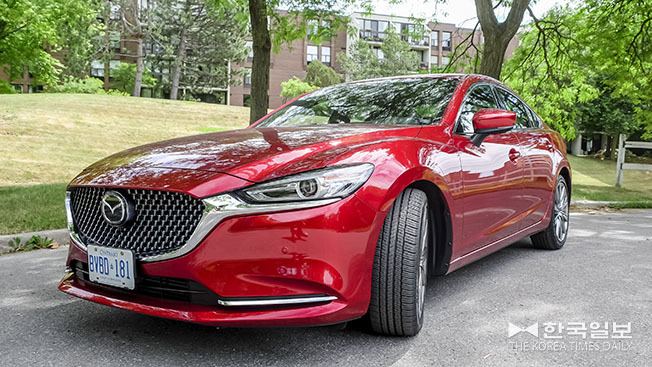 The point is, this writer did not expect Mazda to make the 2.5 litre turbocharged engine available for the Mazda6. 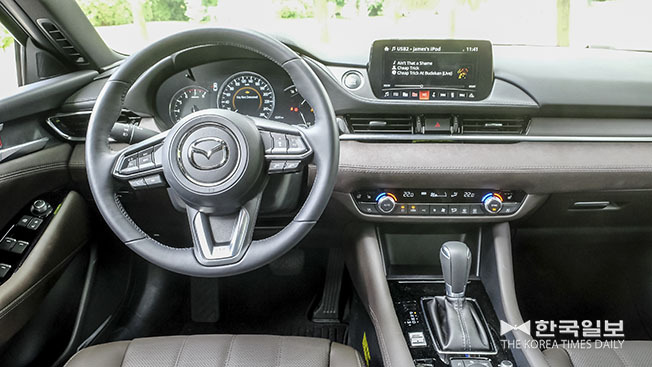 As a smaller company with less financial wherewithal, Mazda probably needs to watch its expenditure carefully and concentrate more on what the consumers clamour for these days – crossover utility vehicles. Because at the present, mid-size sedans are about as popular as Roger Whittaker’s Greatest Hits album at a high school prom party. 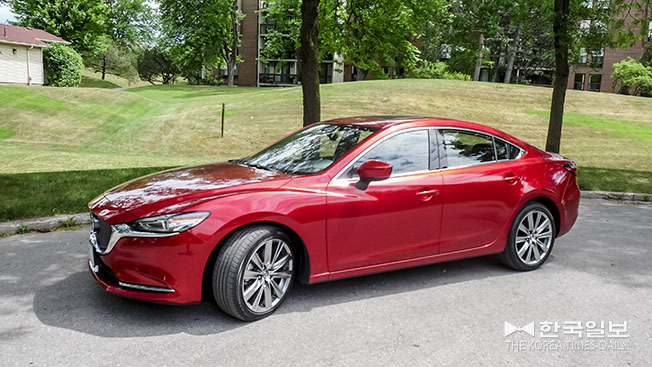 So, thank you Mazda for listening to the small but persistent segment of enthusiasts – including many auto journalists – who wished see the Mazda6 with little more oomph. The car now has the engine it deserves. Even without the force-fed motor, the Six still has a lot going for it. 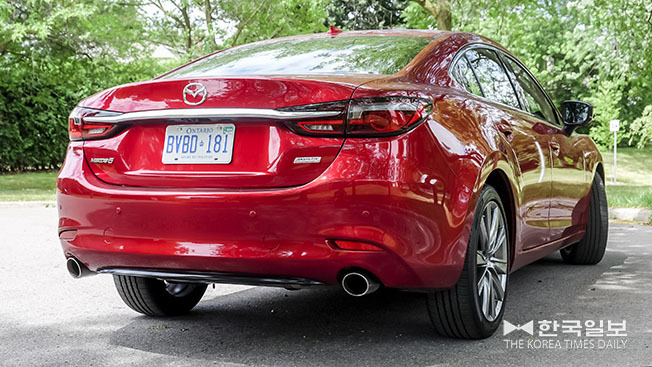 As the AJAC’s 2014 Car of the Year, it remains stylish, sporty and efficient. Yes, the exterior styling is getting longer in the tooth compared to its main rivals, but the elegant design has aged quite well. One needs to really look close, but the 2018 model’s front fascia is tad different. The interior design, too, remains quite familiar. It is clean and simple, but the screen is too small and the rivals have come up with more up-to-date infotainment systems with better interface. Still, compared to the last Six this writer drove in 2016, the Head-Up Display is now projected onto the windshield – as it should – and not onto the tiny and flimsy foldable plastic panel. Mazda got rid of the base GX and added the top-of-the-line Signature model. The GS now starts from $27,000 before taxes and other fees. It is followed by GS-L ($31,600), GS-L with turbo ($33,600), GT ($35,800) and the Signature ($38,800). As before, the base 2.5 naturally aspirated four-cylinder engine generates maximum 184 horsepower and 185 lb-ft of torque. This is more than adequate for most everyday situations. Furthermore, this engine is now even more fuel-efficient, thanks to cylinder deactivation that shuts off two cylinders when more power is not needed. Opt for the turbo and you get to play with either 227 horses when using regular gas or 250 when you spend a little more for the 93 octane premium. Either case, the maximum torque registers at an impressive 310 lb-ft. Among the Mazda6’s main rivals, Hyundai Sonata and Honda Accord produce 245 hp and 252 hp, both with optional 2.0 litre turbo fours. However, their torque numbers only reach up to 260 and 273, respectively. 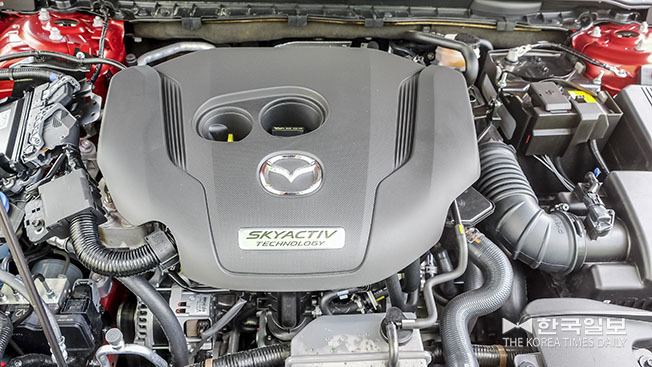 Shared with the CX-9 utility vehicle, the 2.5 turbo four is a peppy engine that has no problem pushing the relatively light sedan (1,622 kg/3,575 lb) to highway speed in no time. No, you still won’t be able to keep up with a Mustang GT, but you can probably leave an over-confident WRX driver eating your dust (Don’t go looking for trouble, though). The engine sounds bit rough at times but it works well with the six-speed auto to deliver a smooth acceleration. No discernible turbo-lag protrudes to tarnish the enjoyment of the drive, either. Another trick up the Six’s sleeve is the G-Vectoring Control. Introduced last year, the system slightly retards power when turning into a corner to shift the car’s momentum forward to give the front tires more traction. At least it is supposed to work that way. But the system is so seamless the driver has no idea if it’s working or not. Compounding the ‘problem’ is that the Six has always been one of the nimblest sedans in its segment. Is it more agile now? I don’t know. Anyway, this writer’s test-car, the Signature model, comes very well-equipped with such high-end goodies as Nappa leather, dual-zone climate control, 11-speaker Bose audio, 19’ alloys, 360 degree camera, HUD, traffic-sign recognition, radar cruise-control, etc. The only option is the metallic paint that costs $450.